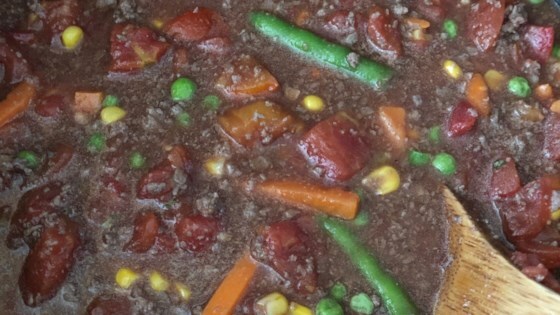 "Vegetable beef soup with tomatoes that's quick, easy, and tasty! May use 2 pounds of lean beef or 2 pounds lean turkey. We like to combine one pound of each! Serve with cornbread or Ritz® crackers!" Heat a large pot over medium heat. Cook and stir ground beef and ground turkey in the pot until completely browned, 7 to 10 minutes. Stir onion into the meat mixture; continue to cook and stir until the onion is translucent, about 5 minutes. Drain fat from the pot and return to medium heat. Pour water and tomatoes into the pot. Season soup with garlic powder, sea salt, basil, and black pepper. Stir beef base through the soup. Add frozen mixed vegetables to the pot; stir. Bring the soup to a boil, reduce heat to low, and cook, stirring occasionally, until the vegetables are cooked through, 20 to 30 minutes. I’ve been craving for this for a while now. Caribou Vegetable Soup ?? I used two pounds of ground beef and it taste just like I remember of my mom's.